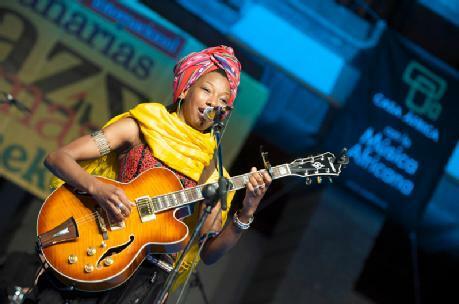 Fatoumata Diawara (29) is the new rising star and musical talent from Mali and France. Although she is relatively new to the music scene she has already performed with the Youssou N'dour, Herbie Hancock and Hank Jones. She currently lives in France and was born in the Ivory Coast to Malian parents. She moved to France to pursue acting, appearing in Cheikh Oumar Cissoko's 1999 feature film La Genèse, Dani Kouyaté's popular 2001 film Sia, le rêve du python, in the internationally renowned street theatre troupe Royal Deluxe, and played a leading role in the musical Kirikou et Karaba. She later took up the guitar and began composing her own material, writing songs that blend Wassalou traditions of Southern Mali with international influences. Her new EP "Kanou" was released May 9, 2011 and her debut album with World Circuit Records will be released in September 2011.